Loreto Sister Maureen Burke will next week be departing for South Sudan to spend three months at the Loreto Rumbek Secondary School. Maureen has been a Loreto Sister for over 48 years and during that time has taught a range of subjects including Maths, Physics and Chemistry at various Loreto Colleges and also in Diocesan Youth Ministry. Over the past years she has volunteered at Mamre, a non-profit organisation in the Western Suburbs of Sydney, supporting refugee families, many of whom are from South Sudan. She has a passion for Pastoral Care and tutors women in English and other subjects to help them complete TAFE. She also organises swimming lessons for mothers and children, many of whom have only dreamt of this opportunity. Maureen visits families after school to tutor the children. Through this she has become a virtual member of these families. During her time at the school Maureen will volunteer as a teacher and has been asked to bring interesting learning ideas to the Maths and Science classes. “I love teaching. I was born to teach. Loreto Rumbek is a boarding school for girls in a war torn country. It’s going to be a new experience. I am told the students are strong women with firm opinions, as are the women at Mamre,” said Maureen. At present the school caters for 185 boarders. A primary school is currently being built. In the meantime students are assembling under a tree, until the building is complete. Thousands of displaced people have flooded into South Sudan in recent years. Despite the sound of gunshots in Rumbek itself, the Loreto School which opened in 2008 is secure within its own compound. Maureen has heard many stories from the women and children at Mamre. Their tales are of starvation, death and devastation. 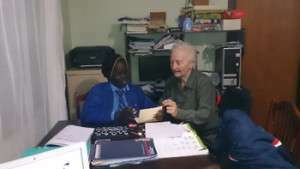 Loreto Rumbek’s Principal, Sr. Orla Treacy from Ireland has lived in Rumbek since 2006. “Each day the students pray for peace and just leaders. They love Mary Ward’s saying that women in time will come to do much,” she said. Maureen also hopes to set up pen-pals between Australia and South Sudan, so students can learn about each other’s worlds.